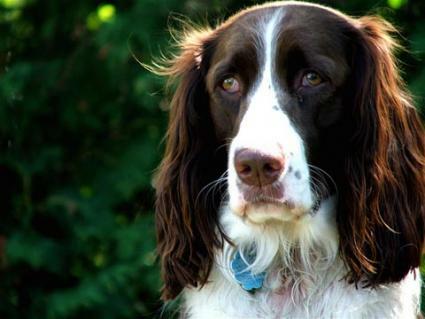 Severe separtion anxiety disorder is a difficult situation for any dog lover. Read about one visitor's situation. My Springer Spaniel is three and half years old, and he has a terrible case of separation anxiety. We believe we have done everything we can, from enrolling him in numerous behavior classes, to visits to the local dog behavior specialist, to having our vet prescribe him anti-depression and anti-anxiety medication. Even though he was house trained since he was a puppy, he still does both in the house when we leave, and it does not matter if I just walked him for an hour and left the house for thirty minutes or four hours. He scratches the doors and windows all the time. One time I found him with his nose and paws covered in blood as he tried to "dig himself out" of the house. Our life revolves around this dog. After work we train him for an hour or so with "sit and stays," picking up our keys and putting our coats on at random moments, hoping that he will eventually learn that no matter what, we will always come back. We tried to do everything right from the first day we got him from a reputable breeder. We have read books on the benefits of crate training, but in the end our dog ate through the numerous crates, big plastics trays and all, even learning to bend the metal spindles on the crate. He would pant and urinate in the crate, so we have stopped doing that. We even tried to buy a big 8x10 foot kennel, but he still got upset and almost choked himself to death when he tried to get out. He knows how to open the refrigerator and cupboards and eat 23 hot dogs in one sitting. We even bought "scatmats" and put them in the places we wanted to keep him out of, but he has figured out how to take the batteries out of the "scatmat." I know you may think I am making this all up, but trust me, this is only about 25% of what I could tell you about our Floyd. We love this dog, and I don't believe that he should be put down (as someone suggested to us before) just because this dog loves us and wants to be with us. He is great with other people and is really good with kids. I must say that he is an amazingly loving creature, who is the greatest dog when someone (Anyone!!! He doesn't care) is at home, he just lies around or plays with his toys. Unfortunately, it has gotten to the point where my own marriage is suffering. My husband and I have noticed that the ONLY time we argue is when the conversation is about the dog and what he has done today. We are anxious to come home from work everyday, as we count once again, what today's damage is. Wow, you really have your hands full. Let me commend you first on taking so many measures to try to help Floyd adjust to your absence. A lot of owners wouldn't go to those lengths. I would be curious to know how old your dog was when you got him, if he spent time with another owner prior to you receiving him, and if you have discussed these problems with his breeder. I am not sure I can solve your problems, especially since you have already consulted the professionals I would have directed you to. However, I have a suggestion for some damage control. Have you considered leaving your dog at a Dog Day Care facility during your working hours? These facilities provide lots of individual attention to dogs in their care as well as lots of supervised playtime with other canines. I realize there would be some expense involved. It would cost about the same as putting a child in day care while you work. Or, you could hire a private sitter to keep him company at home while you work, which may or may not be less expensive. As I see it, you can spend the money on day care or spend it on repairing your home. I think day care is a more proactive choice for all of you. I hope this answer will provide at least some relief for your problem. Update: GM, your problem has stayed with me, so I've been searching for more info on separation anxiety. I've just learned of a method another animal behaviorist used to help another dog with severe separation anxiety, and I'd like to pass the info along to you in hopes that it will help your situation. The animal behaviorist believed this dog was addicted to being with its owner and suggested the cure to the disturbing behavior lay in transferring the dog's addiction to a more appropriate object, in this case a Dog Kong Toy. To do this, the behaviorist added a few slices of ham to the hole in the treat, which enticed the dog to shift his focus to the chew toy, and he received the treat reward for using it when he worked the ham out. This activity was repeated several times each day. Eventually the owner could leave the room while the dog had the Kong without the dog immediately seeking her out. Next, the owner would toss the loaded Kong into the dog's open crate and he would willingly spend time in it with his toy. In time, she could close the crate door before she left the room. The owner increased the time away from her pet, and he slowly learned to deal with his "alone time" without tearing up everything in sight. The main point of this exercise is that the anxiety issue was worked out with the owner in the house, before the more destructive behaviors would occur. The dog was no longer completely addicted to the owner as his sole source of comfort, and was better able to deal with the anxiety he felt until it was no longer an issue. It wasn't an overnight cure, but the owner stuck with it, and it worked. I think this method is worth a try, because you are in the house while the conditioning is going on, and it poses no potential harm to your pet during the process. I would drop all the other conditioning methods that haven't worked for you and focus on this one. Let me know if you try it and how it turns out for you.